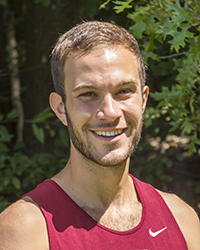 Class: Junior Hometown: Spencerport, N.Y.
NOTES: Three-year letterwinner... All-PAC honoree... 2015: Competed in all seven regular-season meets ... Career-best 8K time of 28:14.3 at the Gettysburg Invite ... Finished 45th at the PAC Championships in 29:44.0 ... Closed season with 16:44 at Wooster Twilight 5K ... 2014: Competed in all seven meets... Overcame early-season injuries to come on strong at the end of the season... Finished 21st at the PAC Championships in 28:31.8 to earn All-PAC Honorable Mention... Ran a season-best 28:25.6 at the NCAA Mideast Regional... 2013: Competed in seven meets during freshman season... Ran a career-best time of 28:21.50 at the Oberlin Inter-Regional Rumble... Finished 37th at the PAC Championships with a time of 28:23.60.